In one of 2001: A Space Odyssey’s most chilling scenes, the once-helpful, now-murderous computer HAL decides his astronaut companions have become a liability. After sending one, Frank, outside the ship for an unnecessary repair, HAL uses a shuttle to clip the astronaut’s oxygen tube. Until this point, shots of Frank feature the sound of his breathing. Then, aside from a few cuts to Frank’s companion Dave watching the events unfold, the soundtrack goes silent. Frank flails for a bit; then his body floats away. He’s HAL’s victim, but he’s also a victim of the immutable laws of physics, and the limitations of a human body unequipped to survive in vacuum without technological protection. No one who’s seen the movie ever forgets that moment, but Alfonso Cuarón’s Gravity suggests he’s spent more time thinking about it than most, wondering what it might be like for someone only slightly luckier than poor Frank to brave the abyss and stare down odds capable of going from slim to incalculable in the blink of an eye. 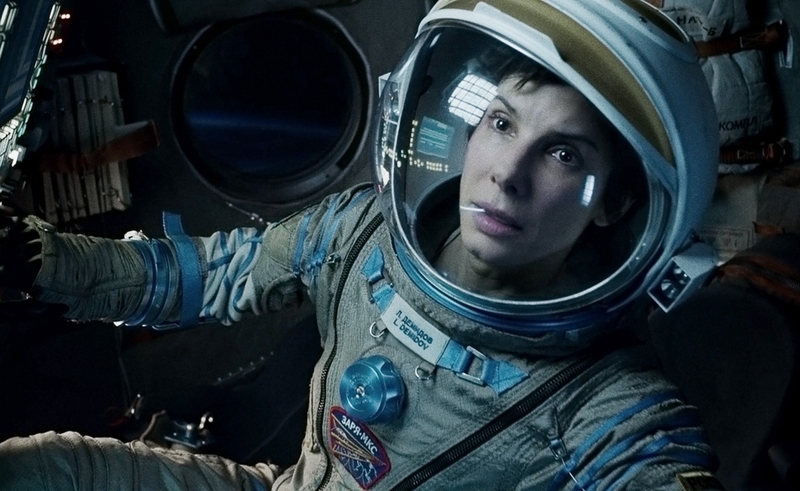 Gravity suggests, too, that Cuarón has wondered about what it takes to survive, not just in terms of wits and strength, but what one would need to to defy instinctive terror and ignore the seeming inevitability of death. For 90 gripping minutes, Gravity finds a way to put viewers in the skin of characters required to do just that. And though the film is an amazing technical feat on every level, it works because it foregrounds the humanity of its characters, both their spirits and the fragile bodies they inhabit. That’s the whole of its story—at heart a classic survival tale of limited resources, applied ingenuity, and resilient spirits—however impressive its outer-space trappings. Those trappings are remarkably impressive, though. The film opens with a long, unbroken shot of business as usual for three astronauts finishing up repairs on the Hubble Space Telescope before heading back to Earth. Matt (George Clooney) is an old hand and has an easy manner as he assists Ryan (Sandra Bullock) with repairs to a system she created. On her first venture into space—having been recruited for her expertise in medical imaging, not astronomy—Ryan has a hard time hiding her nervousness under ordinary circumstances. Then, when Russia’s destruction of one of its own satellites goes awry, circumstances quickly turn extraordinary. Warned to abort the mission and return immediately, they attempt to comply. But shrapnel takes out the third member of their spacewalk, and Ryan is sent hurtling into space. Then things get worse. Ryan and Matt have a single task—to get back to Earth—and a thin line to walk to complete that task. Matt remains nonchalant but insistent, Ryan wards off panic, and the film follows them as they try to find their way down. In doing so, Cuarón never breaks the illusion that he’s actually shooting in space. In shots facing away from Earth, the action unfolds against a deep, star-dappled void. Shots facing toward the planet make it look simultaneously beautiful and unreachable, a destination the protagonists seem less and less likely to reach as the action progresses. Against both, characters float and fumble by, struggling to work against the effects of zero gravity. The camera floats, too—sometimes with them, sometimes beside them, and sometimes assuming their point of view. At one point, it drifts from space into Ryan’s helmet, a shot that might ordinarily make viewers puzzle over how it was accomplished if nearly every shot in Gravity didn’t raise that question. As a piece of craftsmanship, it’s remarkable, even making 3-D feel like an essential component of the imagery. It’s moving too, albeit sometimes in spite of itself. Throwing its characters into the thick of the action almost from its first moments, Gravity never develops them beyond broad outlines. When the script, by Cuarón and his son Jonas, doubles back to provide Ryan with a tragic motivation, it feels like the work of screenwriters, not the whims of fate. Bullock sells it anyway. With Clooney, she turns Gravity into an example of why it sometimes makes sense to hire movie stars, actors with whom audiences already have a history. Clooney has played the rakish hero before. Bullock has played the fragile heroine forced to call on a reserve of hidden strength. They can, and do, compensate for some underconsidered elements, and though it’s frustrating that they have to, the overall achievement of Gravity makes its flaws easier to ignore. However unintentionally, Cuarón has made a welcome corrective to a season—years, really—of special-effects-driven films that treat individual lives like so many pixels. Though set against the vastness of the cosmos, Gravity keeps its scope narrow, asking viewers to invest deeply in the characters’ safety and the value of their lives in a situation where every breath matters, and every choice might bring them closer to safety—or bring about disaster. The film uses the cutting edge of technology to take viewers to the far reaches of the human experience, but also to create a sense of empathy, of investing in the life of another person. It’s a remarkably complex film, but an admirably simple one, too.